I recently borrowed this book on recommendation from a friend, knowing nothing about it or its author that the title didn’t give away. I read the whole book yesterday, and can confidently assert that I made a great decision. 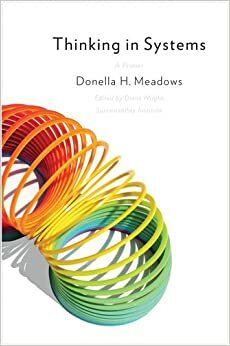 Thinking in Systems is a book by the late American environmental scientist Donella Meadows whose primary goal can be summarized as the translation of the essential concepts required to understand the counterintuitive entities known as systems into a common language for a common audience. Meadows does this superbly, beginning from the most conceptually basic level of systems knowledge, but even having this knowledge already didn’t put me off those chapters because of her engaging writing style and liberal peppering of fascinating quotes and engaging case studies all throughout the book. To get a sense of scale, I think there are more than 100 of these in the book. The problem can be avoided up front by intervening in such a way as to strengthen the ability of the system to shoulder its own burdens. This option, helping the system to help itself, can be much cheaper and easier than taking over and running the system—something liberal politicians don’t seem to understand. The secret is to begin not with a heroic takeover, but with a series of questions. * Why are the natural correction mechanisms failing? * How can obstacles to their success be removed? * How can mechanisms for their success be made more effective? Money measures something real and has real meaning; therefore, people who are paid less are literally worth less. Growth is good. Nature is a stock of resources to be converted to human purposes. Evolution stopped with the emergence of Homo sapiens… Those are just a few of the paradigmatic assumptions of our current culture, all of which have utterly dumbfounded other cultures, who thought them not the least bit obvious. Meadows’ understanding of the role that paradigms play in underlying human systems (e.g. by setting their parameters and operationalizing their utility functions) is of very high esteem to me, as I previously wrote my undergraduate dissertation on cultural paradigms and how they shift. While Meadows doesn’t go into paradigm shift in so much detail, she notes the difficulty inherent to the task, which is an astute (though perhaps not so counterintuitive) observation; in my dissertation I described a framework for this utilizing trauma, whose abnegation of paradigmatic axioms is one of the only reliable ways to secure such a shift, but I can’t blame a non-psychologist for refusing to treat the problem. Overall, I think that this is the kind of book that everyone should have read at least once; the kind you put on the mandatory reading list in high schools. Unfortunately, as Meadows notes, our own ability to ‘transcend’ our paradigms or systems is actually quite limited, using her continued addiction to coffee despite her mechanistic understanding of this reliance to exemplify the point. This can lead us to consider that even if our ability as humans to respond to features of systems may be limited, it still may be possible to build AI systems that are able to address lack of systems comprehension. In consideration of the book’s style and intended audience I was unable to locate within it any flaw, so I’m going to have to go all the way in my evaluation.